Did you know fleas and ticks are not just annoying for pets but can also cause them some amount of harm. Ticks are ectoparasites that hides quite well within the fur of your dog. You will never get to see them unless you actually part the coat of your dog and look deeper. These are blood sucking parasites and attach themselves to your dog by inserting their fangs into the skin of your dog. The reason for fear lies is what ticks can really do to your dog. There are certain species of female ticks that can cause a rare type of paralysis in dogs as they produce a toxin while feeding. Ticks are also quite capable of causing several infections or medical ailment to your dog and the most common is Lyme disease and Rocky Mountain spotted fever. On the other hand, there is the dog flea also known as Ctenocephalides canis and it can live on both dogs and cats. Being a parasite, they also feed on the blood and can deliver an astonishing 4000 eggs on your dog's fur. Flea infestations can cause mild to severe itching and even cause skin infections including anemia and hair loss. They are also known to transmit tapeworms. This is where Bayer K9 Advantix II comes to the rescue! 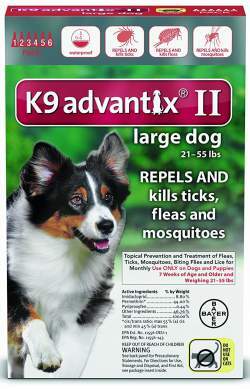 Bayer K9 Advantix II is a topical prevention and treatment of fleas, ticks, flies, and mosquitoes on dogs as well as puppies that are 7 weeks of age or older. The K9 Advantix II is being manufactured and marketed by BayerDVM that supports pet health. They manufacture a variety of products for cats, dogs, and horses and these include flea and tick control treatment for animals or pets. Bayer AG, the parent company is a German multinational pharmaceutical, chemical, and life sciences company that was founded 153 years ago. It comes with a great reputation and Bayer Animal Health division manufactures products that protect millions of food animals. What K9 Advantix II does for dogs? The Bayer K9 Advantix II flea and tick control treatment for dogs being reviewed here is focused at large dogs weighing between 21 and 55lbs. This doesn't mean this product is not available for small dogs. K9 Advantix II is available for dogs weighing from 4-55lbs and even more. This is a topical medication, which means it can be applied directly onto the skin of your dog. Bayer K9 Advantix II is a powerful flea and tick control treatment for dogs and it is quite safe to use for large dogs that weigh 21-55lbs. It is also a highly recommended product by veterinarians. The only known side effects include symptoms of skin irritation like scratching, and redness. Gastrointestinal problems like diarrhea and vomiting have also been reported. There are three different ingredients used in the making of K9 Advantix II and they are Imidacloprid, Permethrin, and Pyriproxyfen IGR. Let's take a look at what these ingredients really are. Imidacloprid is a type of systemic insecticide that normally plays the role of an insect neurotoxin. It belongs to a specific class of chemicals known as neonicotinoids. This chemical impacts the central nervous system of fleas and ticks and is highly toxic to parasites or insects. It is also used widely in controlling a variety of insects including cane beetles, aphids, Japanese beetle larvae, cockroaches, termites, stink bugs, thrips, and locusts. The topical solution contains 8.80% of Imidacloprid. Permethrin is an insecticide that has the distinction of being on the World Health Organization's "List of Essential Medicines". It is considered to be one of the most effective as well as safe medicines for animal health. It is normally sold under the brand name Nix and used for both domestic and industrial insect control. The topical solution contains 44% of Permethrin. Pyriproxyfen is a pyridine-based pesticide that was initially introduced to protect cotton crops against whitefly in the USA. It is an insect growth regulator (IGR) as well as a juvenile hormone analog. This simply means that it prevents larvae from developing into adulthood and thus ensuring fleas and ticks are unable to reproduce. The topical solution contains 0.44% of Pyriproxyfen IGR. The salient benefit of using Bayer K9 Advantix II is that it repels and kills all life stages of fleas as well as Deer ticks, American dog ticks, and Brown dog ticks and its effectiveness is there for almost 4 weeks. How to use K9 Advantix II? Step#3: Hold the applicator tube in upright position and pull the cap off the tube. Step#4: Twist the cap around and place the other end of the cap at the opening of the tube. Step#5: Twist the cap to break the seal of the tube and then remove the cap. Step#6: Part the hair of your dog between his/her shoulder blades. Step#4: Gently place the applicator tip right above the skin of your dog and squeeze. Note: Ensure your dog is in a standing position and apply the entire contents of a single applicator in a single spot only. You need to apply it on the skin and not hair. When used with flea collar or flea shampoo this tick repellent works much effectively than normal. Since, K9 Advantix II is an effective insecticide or pesticide, it has its pros and cons as well. Let’s take a quick look at them. It repels and kills ticks including Deer ticks (causes Lyme disease), Brown dog ticks(cause Ehrlichiosis), American dog ticks (causes Rocky Mountain Spotted Fever), and Lone Star ticks (causes Ehrlichiosis). Pyriproxyfen IGR in K9 Advantix II repels and kills flea and disrupts all stages of a flea life cycle. It is easily available as it is an Over-the-counter flea and tick control product. It kills fleas within 12 hours and continues to prevent any infestation for a month. It provides a 5-way protection to your dog against fleas, ticks, mosquitoes, chewing lice, and biting flies. It is a topical medication that can cause temporary eye injury and is harmful to humans if absorbed through the skin. K9 Advantix II is highly toxic to aquatic organisms including fish and invertebrates. 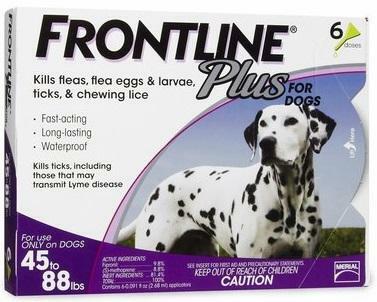 100% effectiveness against adult fleas, ticks, chewing lice, mosquitoes, and lice. Yes, there are several top flea and tick control treatment for dogs available out there in the market but the K9 Advantix II by Bayer does stand out of the crowd. It is not only a highly effective treatment but is easy to apply.